Real life resources to help in your vehicle purchasing experience. Essentially, the auction is a place where licensed dealers go to buy or sell their inventory. Now, more than just dealers are involved. Leasing companies, banks, credit unions, rental agencies, fleet companies, etc, etc, are all tied to the auction process because it is the most convenient way for all involved to capture their buying audience in one, central location. Basically the auction is a facilator between the buyers and the sellers. 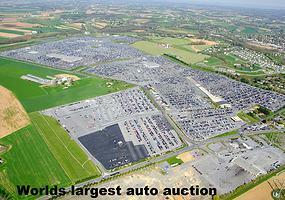 Unless it’s a trade-in, EVERY pre-owned car at a dealership finds its way to, and through a wholesale auto auction. Years ago, wholesellers would move these vehicles. Those days are gone. 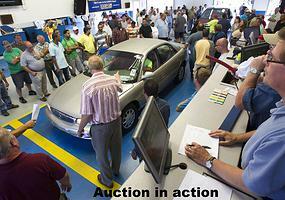 Now the auctions are THE place where pre-owned units are moved. 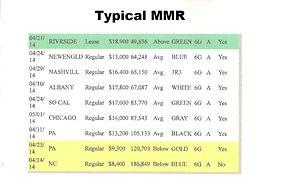 What is an MMR Manheim Market Report? An MMR is a report that dealers have access to that simply lists the sale of every vehicle at any Manheim auction across the U.S. It is THE resource dealers use to determine what they should pay for a vehicle. We email these reports to buyers to help them see exactly what the vehicle they are interested in will sell for at the auction. No other dealer that I know of will share this information. Below average condition units are highlighted in yellow, average condition units are highlighted in white and above average condition units are highlighted in green. This info is meant for serious buyers. Basically, the buying process begins with a phone call or an email. The customer, at this point, has a general idea of what they want. We discuss option packages, colors, mileage, and anything else that is significant to the purchase. We then reference the market reports (MMR) and let the customer know what their vehicle will likely cost via the auction. Total costs are discussed. The auction charges a “buy” fee. It will vary depending on the cost of the vehicle. Generally between $175 and $300. If travel is necessary, those expenses are estimated. We DO NOT charge extra for this service. We just need to be reimbursed for our expenses. Sales tax (for Arizona residents) is calculated based on the price the unit sold for at auction. Last is our fee of $650. When the OK is given the search begins. 28 years of experience helps in the search process. Once purchased, the customer is notified, a spotless detail is performed and then the vehicle is delivered. We buy and sell what we would feel comfortable owning or having one of our four children drive. It’s that simple. What types of vehicle’s are available? How about a warranty, or financing? Literally, every type of vehicle you can imagine is available. Mileage can range from a few hundred miles to several hundred thousand miles, and everything in between. Condition can range from “absolutley pristine” to “don’t even think about it!” and again, everything in between. Imagine a car lot the size of Tucson. That’s what’s available to us through the auction buying process each week. Now what about warranties? All manufacturer warranties stay with the vehicle IF the vehicle still falls under those parameters. Each manufacturer is different and offers different terms to their warranties. We can help with that, but due diligence is also very important. An aftermarket warranty is available through our credit union we use for financing and also many warranties are available online. That’s exactly how I got my warranty for my Ford truck. After doing some research online, I was able to save almost $900 over what the local Ford dealer wanted here in Tucson, for the exact same warranty! A little legwork can pay great dividends. Is financing available? It sure is. Right now we work very closely with Tucson Federal Credit Union who has been wonderful about getting our customers financed. Rates are as low as 2.9% and up from there, depending on your credit score. We work closely with Jeff Blades at the Speedway/Alvernon branch and he is the absolute best. Let us know if you need help with financing and we will do all we can to get you pointed in the right direction.